In the urban arena, museums, classes, art hops, and an artist’s impression is vast and apparent. Artistry has a certain “look”. In rural Appalachia, is it possible that the most apparent art has gotten lost in plain sight? Some would say Prestonsburg is located in the center of Nature’s painting, somehow simultaneously in the valley near the rivers and on the edge of the mountains grazing the clouds. It’s no wonder that art has been engraved in eastern Kentucky natives for generations. Chances are your grandma can quilt an heirloom masterpiece. Your grandpa can pick a banjo just fine, and your mama can carry a tune as sweet as a bird’s whistle. It’s who we are. As an area defined by coal, mountains, and poverty to many in the country, much of our own self-identity had been stripped away after the coal industry shutdown. That songbird hasn’t done too much singing lately since its nest flew away. Yet, in the process of an economic revitalization from the ground up, something quite unique has emerged—color, song, dance, and creativity. Since its initial design, the group has left a trail of paint, smiles, and intrigue. Where do you start when art can be created anywhere? Perhaps in the place that holds the brightest imaginations. Star City Arts has partnered with many surrounding schools to create murals, encouraging words, and bright, welcoming centers. As Heinze recounts, “Prestonsburg is our home, it’s where we were raised and want to see it grow for the youth and current residents. If you recall on July 4th when the streets of downtown Prestonsburg were filled with music, people dancing, children coloring with chalk, the smell of fresh foods filling the air, and much of the community rejoicing in one place under fireworks, that was a newly annual event known as Star City Day. The extraordinary day was started by the Star City Arts council to create a vibrant and creative day that all could enjoy. They certainly succeeded with that mission, allowing businesses, artists, and Star City attendees to mingle together and enjoy one another’s work. The question remains, is there a place for artists to thrive in small-town America? The supporters of Star City Arts sure believe so. “The goal is to inspire the region’s innate creative potential and help expand that for both children and adults. We feel our work now acts as a catalyst for the growth we hope to see in the next five years.” They certainly seem to be on to something. As a central industry has changed, seen in its place is an influx of musical talent locally at venues like the Mountain Arts Center, Jenny Wiley Theatre, and Tuesday Night Songwriters Scene along with a blossoming of art-based businesses and events like the Prestonsburg Night Market series, Russel May Retrospective, and many downtown stores such as the Mountain Muse and City Perk creating gallery space. Both Heinze and McGuire invest their time and talent into the place they call home; a place where museums and galleries do not line their city center but where art is rich, rooted, and alive. Each share their craft with others, whether students are looking to fine tune their skills or have a simple escape. 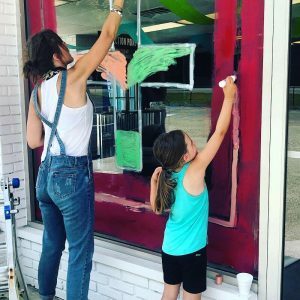 You can catch both hosting art and painting lessons to all ages locally, with Jenna’s “For the Love of Art” youth art classes and Leslie’s group painting sessions receiving rave reviews from the community. Art is blossoming from the home-grown roots in which it’s always lived.